On April 10 at 18.00, the presentation of the 2nd in 2017 issue of the journal Slověne will be held in the German Historical Institute in Moscow. The registration of participants is available on this link. The Editorial Team of Slověne = Словѣне. International Journal of Slavic Studies congratulates its Editor-in-Chief Fjodor Uspenskij on his election as a Corresponding Member of the Russian Academy of Sciences. We would like to announce officially that the Institute for Slavic Studies (ISS) and Moscow State University of Education (MSPU) have concluded a contract between themselves and with the Editorial Team, stating that MSPU has become a new Publisher of the international academic journal Slověne = Словѣне. This is a well organized and respected journal, its Editor-in-Chief is well known in the field of Slavic and German Studies, and the review policy, board, and emphasis upon scholarly standards greatly impress. The content of the issues is of a quite high standard; at the same time, it covers the field of Slavistics in a very broad way, both thematically and chronologically. The range of authors is also very wide, including scholars from both Eastern and Western Europe. It could become a very important scholarly venue for the exchange of ideas and methods of specialists in Slavic Studies, especially for Eastern Europe. I would like also to stress the easy accessibility of journal contents and good structure of the Internet site, where all necessary materials could be easily found. There is a weakness, which is the low citation count: this has to change going into the future, but the journal does merit inclusion in SCOPUS. In order to increase the citation index of our journal, the Editorial Team will strive to improve the requirements for materials submitted and select from those the most worthy and important ones. In the SCOPUS database itself, the metadata of our issues will be visible later. We are pleased to announce that Slověne = Словѣне. International Journal of Slavic Studies has been accepted for indexing in the Emerging Sources Citation Index (ESCI), a new edition of Web of Science™. Content in this index is under consideration by Thomson Reuters to be accepted in the Science Citation Index Expanded™, the Social Sciences Citation Index®, and the Arts & Humanities Citation Index®. 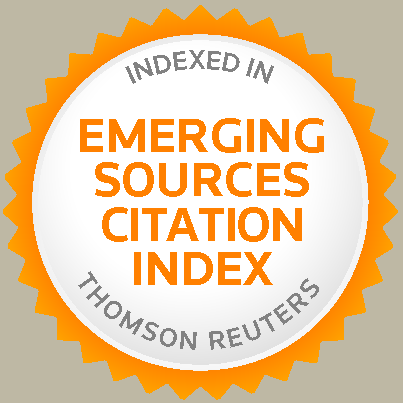 The inclusion of Slověne in the Emerging Sources Citation Index demonstrates our dedication to providing the most relevant and influential Slavic studies’ content to our academic community. We are happy to inform you that our journal is indexed in the MLA International Bibliography (Modern Language Association of America, USA) and Linguistics Abstracts Online (Wiley-Blackwell, USA) and also listed in the MLA Directory of Periodicals. Our journal is now graded in the database RoMEO (SHERPA Services, University of Nottingham, UK) which is a searchable database of publisher’s policies regarding the self-archiving of journal articles on the web and in Open Access repositories. The journal is assigned to the “blue” category. It means that our authors may archive post-print (i.e., final draft post-refereeing) publisher’s version. Alexander Grishchenko, Executive Editor of the journal, took part in the 4th International Scholarly and Practical Conference “World-Class Academic Publication – 2015: Current World Trends and Practice in Editing, Publishing, and Assessment of Academic Publications,” St. Petersburg, May 26–29, 2015. You can read his contribution Slověne = Словѣне: The Experience of Establishing and Editing the First International Journal of Slavic Studies in Russia (in Russian, with the abstract in English) here. We are happy to inform you that our journal has joined the European Reference Index for the Humanities and the Social Sciences (ERIH PLUS) operated by the Norwegian Social Science Data Services (NSD). We are happy to inform you that our journal has joined the international databases EBSCOhost (USA) and Index Copernicus (Poland). The updated website of the International Journal of Slavic Studies Slověne = Словѣне is now operating through Open Journal Systems (OJS), which significantly expands the possibilities for Readers, Authors, and Editors, enabling all of them to integrate easily and effectively into the global information space of modern scholarship.